Containers of New Birds.—Aboard the trading ship of the Chinese that arrived were brought containers of new birds. The purpose of these birds are to eat bugs found in the dirt like caterpillars [peelua], koe [worms], etc. Last Wednesday, the birds were released. When they were immediately released, they quickly went in search of bugs. The number of those birds was one-hundred and eighty-four. Some of them died, but the majority are living. Therefore, anyone who sees these new birds is prohibited from killing them lest they be in trouble with the Law. Ke Au Okoa, Buke I, Helu 24, Aoao 2. 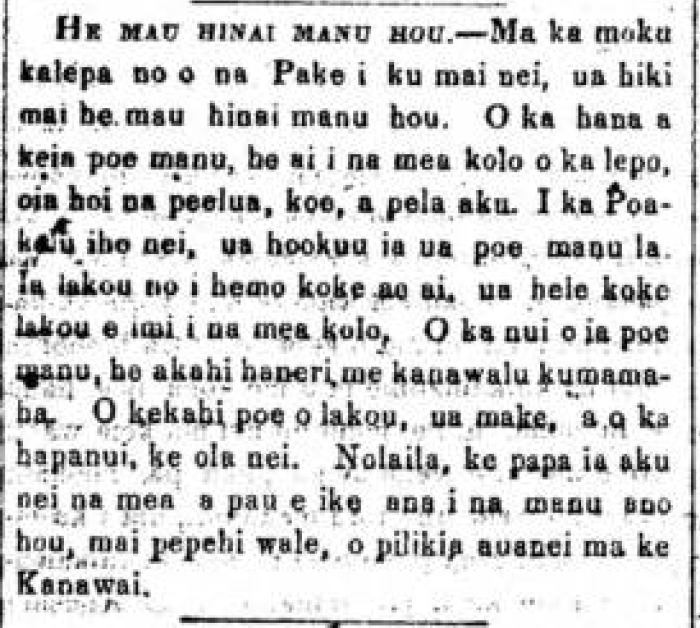 Okatoba 2, 1865.